Definition at line 1472 of file deflate.c. Definition at line 192 of file deflate.c. Definition at line 1620 of file deflate.c. Definition at line 1608 of file deflate.c. 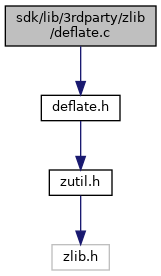 Definition at line 758 of file deflate.c. Definition at line 182 of file deflate.c. Definition at line 1626 of file deflate.c. Definition at line 1629 of file deflate.c. Definition at line 107 of file deflate.c. Definition at line 155 of file deflate.c. Definition at line 111 of file deflate.c. Definition at line 163 of file deflate.c. Definition at line 766 of file deflate.c. Referenced by CMSZipCodec::Compress(), compress2(), deflateParams(), gz_comp(), zipCloseFileInZipRaw64(), zipWriteInFileInZip(), and zlib_write_compressed_bit(). Definition at line 1827 of file deflate.c. Definition at line 2133 of file deflate.c. Definition at line 2060 of file deflate.c. Definition at line 1929 of file deflate.c. Definition at line 1646 of file deflate.c. Definition at line 655 of file deflate.c. Definition at line 1105 of file deflate.c. Definition at line 1079 of file deflate.c. Referenced by CMSZipCodec::Compress(), compress2(), deflateCopy(), deflateInit2_(), gzclose_w(), zipCloseFileInZipRaw64(), and zlib_write_compressed_bit(). Definition at line 448 of file deflate.c. Definition at line 243 of file deflate.c. Definition at line 231 of file deflate.c. Definition at line 571 of file deflate.c. Definition at line 531 of file deflate.c. Definition at line 545 of file deflate.c. Definition at line 508 of file deflate.c. Referenced by deflateInit2_(), and gz_comp(). Definition at line 470 of file deflate.c. Definition at line 379 of file deflate.c. Definition at line 520 of file deflate.c. Definition at line 356 of file deflate.c. Referenced by deflate(), deflateBound(), deflateCopy(), deflateEnd(), deflateGetDictionary(), deflateParams(), deflatePending(), deflatePrime(), deflateResetKeep(), deflateSetDictionary(), deflateSetHeader(), and deflateTune(). Definition at line 620 of file deflate.c. Definition at line 1485 of file deflate.c. Referenced by deflate_fast(), deflate_huff(), deflate_rle(), deflate_slow(), and deflateSetDictionary(). Definition at line 733 of file deflate.c. Referenced by deflate(), and deflate_stored(). Definition at line 1197 of file deflate.c. Definition at line 1239 of file deflate.c. Referenced by deflate_fast(), and deflate_slow(). Definition at line 719 of file deflate.c. Definition at line 1167 of file deflate.c. Referenced by deflate_stored(), fill_window(), netcon_secure_connect_setup(), netconn_secure_connect(), test_blocking_rw(), and test_readfileex_pending(). Definition at line 204 of file deflate.c. Referenced by deflateParams(), and fill_window(). Definition at line 134 of file deflate.c. Referenced by deflate(), deflateParams(), and lm_init().
" deflate 1.2.11 Copyright 1995-2017 Jean-loup Gailly and Mark Adler "